If you are looking for some quick and easy appetizers/snacks, then these semolina savory paniyarams fit perfectly. 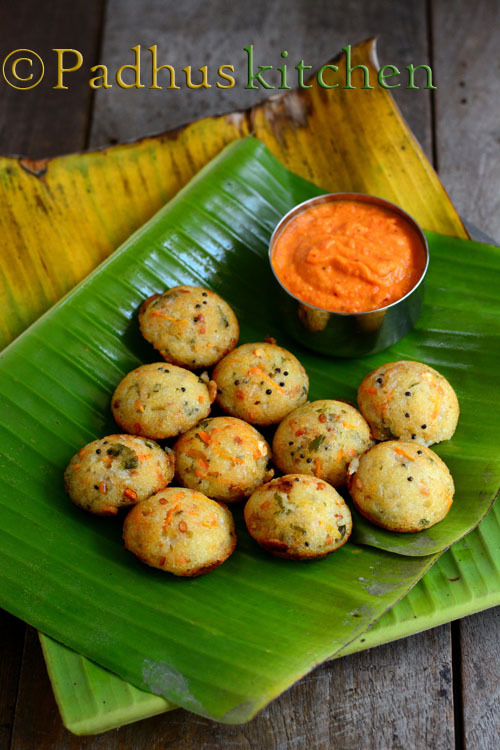 Rava Kara Paniyaram is a very easy snack prepared with semolina. I have made it savory by adding sauteed onions, green chillies and ginger. It can be given to kids as an after school snack. You can also add grated carrot, beetroot or sweet corn to make it more healthy. It can be had as a light tiffin or as a tea time snack. Today we will learn how to make rava kara paniyaram following this easy recipe with step wise pictures. In a bowl, mix rava and curd together with a little water. Let it stand for 1 hour. Heat oil in a kadai/pan, add mustard seeds, when it splutters, add urad dal and bengal gram dal (channa dal). When dal turns golden brown, add finely chopped onions, green chillies, ginger and saute until onions turn transparent. Add the onion mixture, grated carrot, salt needed, cooking soda to the rava + curd mixture and mix well. Add needed water to get idli batter consistency. Heat a paniyaram pan /appe pan, add 1/4 tsp of oil inside the holes. Fill the holes with the sooji batter. Cook covered on low heat. When the sides start to leave, flip it over to the other side using a spoon. Cook on low heat until it browns. You can flip 2-3 times and cook until it browns evenly on all the sides. Enjoy with tomato chutney or tomato ketchup or any chutney of your choice. Check out more Rava Recipes and more Snacks Recipes. Yummy, will try very soon. Yes, you can but soda gives more softness. What can I substitute for Curd and make this vegan?